Driver impedance measurements require simultaneous measurement of the voltage across the driver voice coil and the current through it. While the voltage across the coil can be directly measured by an analyzer input, the current in the circuit is calculated from the measured voltage across a precision resistor of known value, called a sense resistor. The IMP1 Impedance Fixture fulfills the role of sense resistor and is a convenient accessory when measuring impedance with an APx Series analyzer. The IMP1 provides a choice of two sense resistors, with values of 1.0 Ω and 0.1 Ω respectively. XLR connectors on the front of the fixture provide analyzer connections while double-banana connectors on the rear provide connections for the driver and a power amplifier. 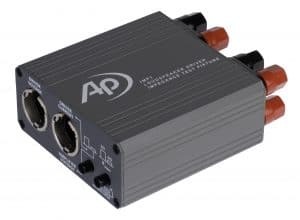 For electro-acoustic test and impedance measurement set-ups, please also see the APx1701 Transducer Test Interface, and APx accessory that integrates instrument-grade amplifiers, microphone power supplies and current sensing. For additional information on the IMP1, including specifications, please see the IMP1 Impedance Fixture User’s Guide.